We all dream of shooting off for a weekend or longer and tracking to a beach or a bush camp. And that means finding a camper that’ll be a beaut weekender while still being able to take on the rigours of longer treks. 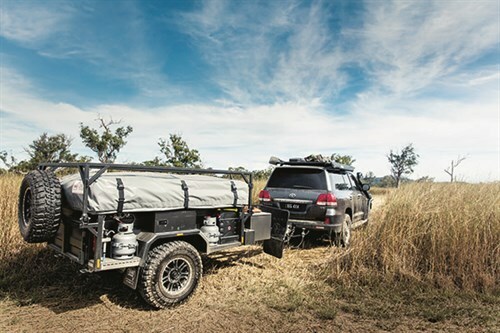 Trackabout Campers reckons its innovative makeover of its Safari Outback Tourer is just the ticket for those keen on something that’s fast and easy to set up with enough comforts, durability and manoeuvrability for an outback haul. We took the Trackabout Safari Outback Tourer to a rural spot south of Brisbane, Qld, in sight of the renowned Sirromet Winery to see what the camper had to offer. 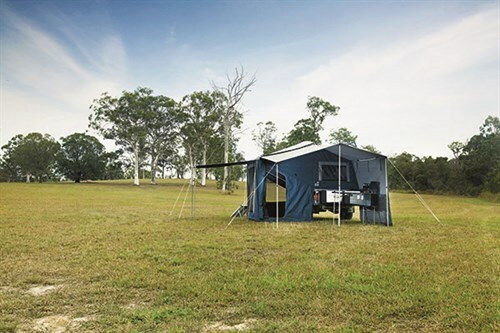 The Safari Outback Tourer tent, in its traditional configuration, provides around 6.72sqm of living space excluding the awnings. Space-wise, that’s probably about all you need for a weekend away and it means you don’t need to spend ages setting up camp. After all, setup time is often touted as the biggest bugbear of softfloor campers. I can imagine that many prospective buyers, who’d benefit from a lightweight configuration, actually scurry away from the idea, frightened they’d waste too much time establishing camp rather than enjoying the weekend at their favourite destination. Part of Trackabout’s solution is to join the poles permanently to the tent. That means you drag them out as you roll the tent into position and fix them in place as you go. Now, here is the really ingenious bit. When setting up beside your favourite beach on a warm day for a surfing, boating or snorkelling weekend, you don’t always need large canvas walls wrapping completely around you. It’s just too hot and unnecessary if all you want is a little privacy. 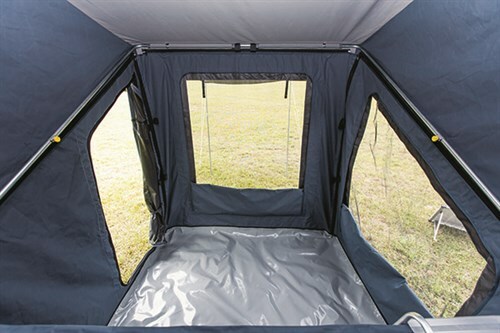 Trackabout has made its tent with walls that detach along roughly a 45° angle, turning the tent into a sort of sun visor, while the bedroom is kept private thanks to a convenient zip-up screen. This means you have the option of building either a shaded area for a quick stopover or having a completely enclosed room and floor when you feel the need for something more substantial or want extra room for bunks for the kids. In terms of size out on the trails, you’re saving a bit of weight on the build. And towability is also influenced by your choice of hitch. The Safari’s Ozhitch is just right when it comes to tackling offroad conditions. It means you’re working with an easy to use, low profile self-aligning setup able to cope with the sort of angles offroad trekking sometimes dishes up. What’s more, it’s lockable and that’s great for security. The review camper has a very good exit angle and, when you combine that with a sub-tonne Tare and mud-terrain tyres, it certainly has legitimate offroad credentials. Nonetheless, there are times you’re going to get stuck in the soft stuff. Don’t fret; the camper has Maxtrax on board, ready to provide a high traction surface to get you out of strife. Also noteworthy is the review camper’s fully galvanised hot-dipped chassis and Cruisemaster independent suspension, rated to carry 2t. Unfortunately, in the time we had with the camper, we didn’t get a great opportunity to really push the suspension. Just the same, with quality internal polyurethane bump stops built into the design, there’s good protection against the coil spring becoming coil bound, making it well-suited to offroad touring. 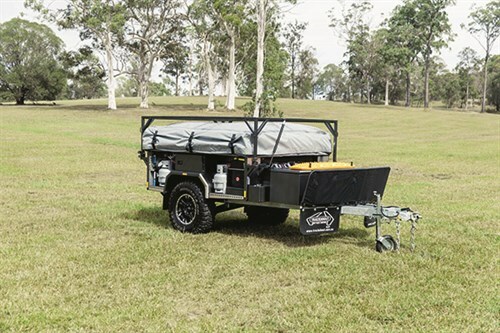 Ride is very important, but suspension is also about what you can carry and this camper provides plenty of storage – in the tent, out front and in the kitchen. Simple LED light strips do the job providing convenient, reliable, and an easily assembled lighting system. There’s plenty of power courtesy of two 125Ah AGM batteries supported by the optional solar panels, and inverter and management system. The camper also boasts an external hot water system, external shower and a convenient external tap on the drawbar plumbed to an 85L tank. In a way, camping with a camper is about having somewhere comfortable to rest and sleep in between checking out the interesting adventures the great outdoors has to offer. So, bed size and bedroom space is important. This camper has a comfy camper-queen-size high-density foam mattress with enough room to spread out for a comfortable night’s sleep. What’s more, the tent is tall enough to enable an average-sized adult to stand without having to stoop too much. The slide-out kitchen sits comfortably under the side annexe and is a simple yet elegant design. The easy-to-use kitchen is complete with Smev stove and a stainless benchtop return which is ideal for cooking a little butterfly lamb and potatoes to go with the Sirromet chardonnay that’s secreted away in the built-in 60L fridge box. The only trouble is, if you want to cook some carrots as well, you have to juggle things on the Smev a little as there are only two burners. Nonetheless, the clean-up is made easier thanks to a Smev stainless steel sink with a 12V pump plumbed to cold and hot water thanks to a gas hot water system at the front of the camper. And you’ll find all the condiments you need in a generous pull-out pantry. Lastly, you get to enjoy a nice ambience at dinner thanks to the Bluetooth-enabled stereo. In short, as I’ve found in previous Trackabout Safari Outback Tourers, it’s a kitchen that makes outdoor cooking easier. out poles. And if you find yourself travelling with a couple of small kids, you won’t need to worry for at least of few years as there’s enough space for two adults and two toddlers. Starting at $24,500, this model looks like value. However, once you fit it out with all the options the review camper had, including an integrated power system, solar regulator, smart charger and boat rack, then you’ll bump the price up to nearly $37,000. Although this might start to feel a little pricey, the camper’s design and build quality make it worth considering for any adventure-seeking couple or empty nesters looking to downsize.